Fancy Blue Curtains, all flowery and gathered-up at the ends. Very fancy. A Computer that was never turned on. Music System, that only came on a parties. And a picture of something or other on the wall. A big fat zero I hit there. So I look in the bedroom. It’s a small room, with only a bed and a chest of drawers. But the bed is mighty fancy: it’s all gleaming and gold, with fancy white covers. Then something emerges from beneath the covers, and I jump out of my skin. For some strange reason I think this thing is a dog; not that I’ve met one or seen once face to face. It’s instinct, don’t ask me why or how, it just happens. But the moving thing makes no woof or barking sounds. Then I catch a whiff of it’s smell: cat, or rather kitten to be exact. I jump onto the side window ledge to get a better look. And while I’m becoming accustomed to my new neighbour, another little head, peeks from underneath. This new one is blue, and the first a browny cream. I can see they are quite new to their Yuppie place, quite frightened . Although the bed looks lovely and soft, and I feel a little jealous. Old Felix keeps his bedroom locked, and I’m certain his bed is not as comfy or fancy. 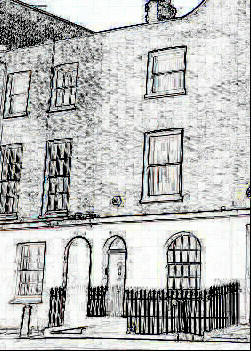 This entry was posted on Saturday, September 12th, 2015 at 8:50 am	and tagged with Camden Town, King of Royal College Street, Novel, Sean Lavery, SJ Lavery and posted in Camden Town, King of Royal College Street, Sean Lavery, Short Novel, SJ Lavery. You can follow any responses to this entry through the RSS 2.0 feed.